The Aland islands (Åland in Swedish, Ahvenanmaa in Finnish) are positioned between eastern Sweden and southwestern Finland, about 65 miles east of Stockholm, Sweden. The islands were originally settled by Nordic peoples, today called Alanders. The Aland people developed a specific genealogy, different from other Scandinavians, being both isolated and connected by sea. Still, Alanders are considered to be Swedes. The Alanders were influenced by Swedish and Danish cultures in the early development of Scandinavia. Today, the Aland Islands are an autonomous and unilingually Swedish province of Finland. Aland is made up of over 6,500 islands and rocky outcrops covering 572 square miles. 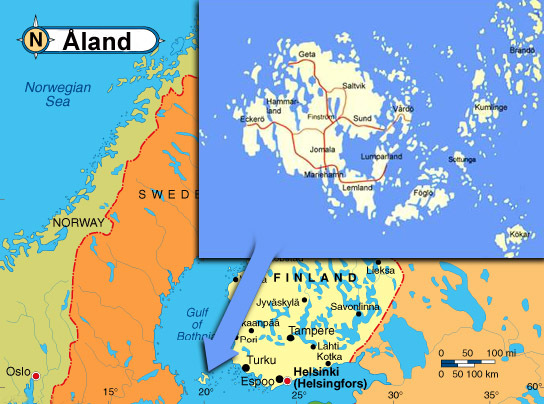 The largest island is called Fasta Åland (Main Island of Aland) where 90% of the population live. It extends over more than 70% of the total land area of Aland (see map on left). The population of Aland in the 18th century was about 11,000, inhabiting 80 of the islands. In 1905 there were some 22,000 inhabitants, living on 150 islands. Today just over 25,000 inhabitants live on only 65 of the islands. Nearly half the population live in Mariehamn, the only city in Aland. The smallest district, and also the smallest in all Finland, is the outer island district of Sottunga, with some 130 inhabitants. As far back as is known the Alanders have been Swedish speaking Nordic peoples, with their culture closely resembling that of Sweden, with local variations. During the 10th century, dense settlements began on the Main Island where large numbers of farmstead cemeteries and house foundations still exist (from the Viking era 800 - 1000 AD). Extensive trade connections were made with neighboring countries by the 11th century (see Viking routes), and the first traces of Christianity emerged. Aland's oldest churches were built during the 12th century. Aland and Finland became part of the Swedish Crown under King Olav during the 13th century. In the 14th century, Kastelholm Castle was built on the Main Island, a major center through the 15th and 16th centuries. Aland saw much conflict during the 17th and 18th centuries, forcing many inhabitants to Swedish and Finnish mainlands. Aland saw significant change in the 19th and early 20th centuries. The Aland Islands, with a fairly independent administration, belonged to the Kingdom of Sweden from the early 13th century until 1809, when Sweden was forced to relinquish Aland and Finland to Russia. The Russians quickly incorporated Aland with Finland. When the Russian Empire disintegrated, the League of Nations decided in 1921 that Finland should receive sovereignty over the Aland Islands, with Aland's heritage to remain. Finland had to guarantee the preservation of Aland's Swedish language, culture, customs and self-government. The decision was supplemented by a treaty between Finland and Sweden, known as the Autonomy Act, which gave Aland autonomy, demilitarization and neutralization. Alanders soon elected a parliament, and their first session was held on June 9, 1922, which date is now celebrated as "Aland Autonomy Day." In 1954, Aland received its own flag (the "Alandian flag," see variations below), and now has its own representative in the parliament of Finland.